In March, the New England Journal of Medicine published the first large, multicenter, randomized, controlled trial to examine the efficacy of arthroscopic partial meniscectomy plus physical therapy compared to physical therapy alone. Between the two experimental groups, improvements from baseline do not differ significantly. The authors suggest that their findings provide encouragement for offering non-operative strategies. Jeffrey Katz, MD and colleagues recruited 351 patients who were age 45+, had osteoarthritis of the knee, and who had symptomatic meniscal tearing. 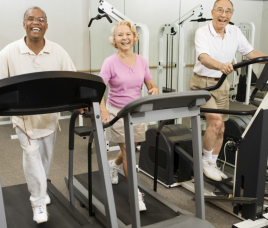 They randomized these patients into a surgery + PT group and a physical therapy only group. Those in the surgery group received an arthroscopic partial meniscectomy followed by a standardized physical therapy program. All surgeries were performed by fellowship-trained surgeons who performed at least 50 of these procedures per year. Patients in the physical therapy only group received the same standardized physical therapy program without the surgery. The physical therapy program was thorough but fairly standard. Patients received a home exercise plan and one or two physical therapy visits per week for about six weeks. The primary outcome was change in scores on the Western Ontario and McMaster Universities Osteoar-thritis Index (WOMAC). These scores range from 0 to 100 with higher scores indicating more severe symptoms. At six month assessment, patients in the surgery + PT group average a 20.9 point improvement while patients in the physical therapy only group average an 18.5 point improvement. The difference was not statistically significant. Improvements were largely maintained at 12-month assessment with little dif-ference between the groups. At enrollment into the study, patients with a strong preference for physical therapy or surgery were excluded from the study, because patients needed to be randomized to a treatment arm. All patients in the physical therapy group were given the option to drop out of physical therapy in favor of early surgery or to elect surgery after the completion of physical therapy. At six-month follow-up, 70% of the physical therapy only group had not elected surgery. At 12-month follow-up, 65% of the physical therapy group had not elected surgery. Patients who had received physical therapy previously were not excluded. We contacted the lead author to ask how many patients had received previous rehab for the same complaint. Dr. Katz kindly replied that previous PT was typical, but most programs were “not very thorough.” This detail highlights the fact that previous physical therapy may not rule out rehab po-tential at a different center or in a more thorough program. This study gives encouragement to clinicians who want to offer their patients a physical therapy referral along with surgical options. When patients have osteoarthritis plus a symptomatic meniscal tear, clinicians can tell patients that a study in the New England Journal of Medicine finds the outcomes between arthroscopic surgery and six weeks of physical therapy are virtually the same. Surgery is always an option after physical therapy, but research suggests that up to 65% of patients will not request surgery after going through a good physical therapy program. Do Most PTs Treat Back Pain Incorrectly?